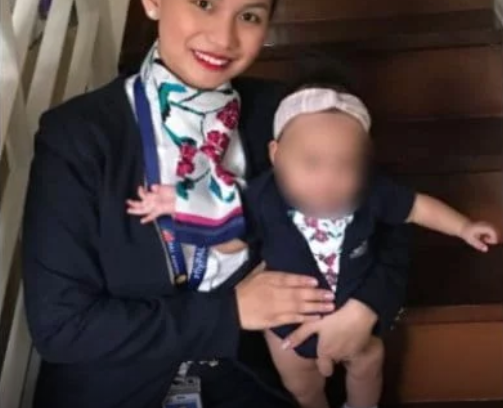 A photo of Patrisha Organo, a 24-year-old flight attendant from Philippine Airlines express are going rounds on social media, after a photo of her carrying a baby was posted in Facebook. According to Organo, she said in her post that Wednesday, November 7 is going to be the best day in her flying career because she is applying to be qualified as an 'evaluator'. During the flight, there was a baby who was crying out loud like there was something's going on with the baby. She approached the mother of the baby and asked if everything was okay. The teary-eyed mother told Organo, that she run out of formula because the mom of the baby was already in the airport at 9pm Monday night and the flight departed after 5am on Tuesday which explains why the mom ran out of formula milk. Organo, without hesitations offered her breast milk to the mother since she is also a breastfeeding advocate. 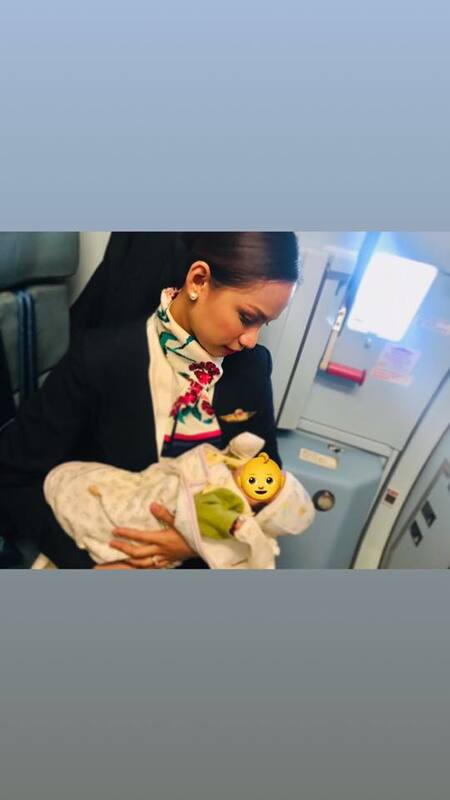 A line administrator on flight, assisted her ad nurse the baby. 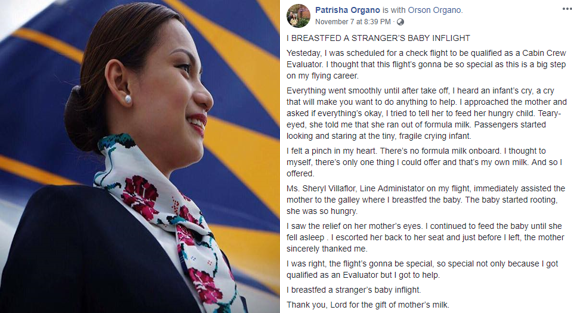 As the baby went to sleep, she gave back the baby to the mother and the mom was very thankful with the 'heroic act' Organo did during the flight. 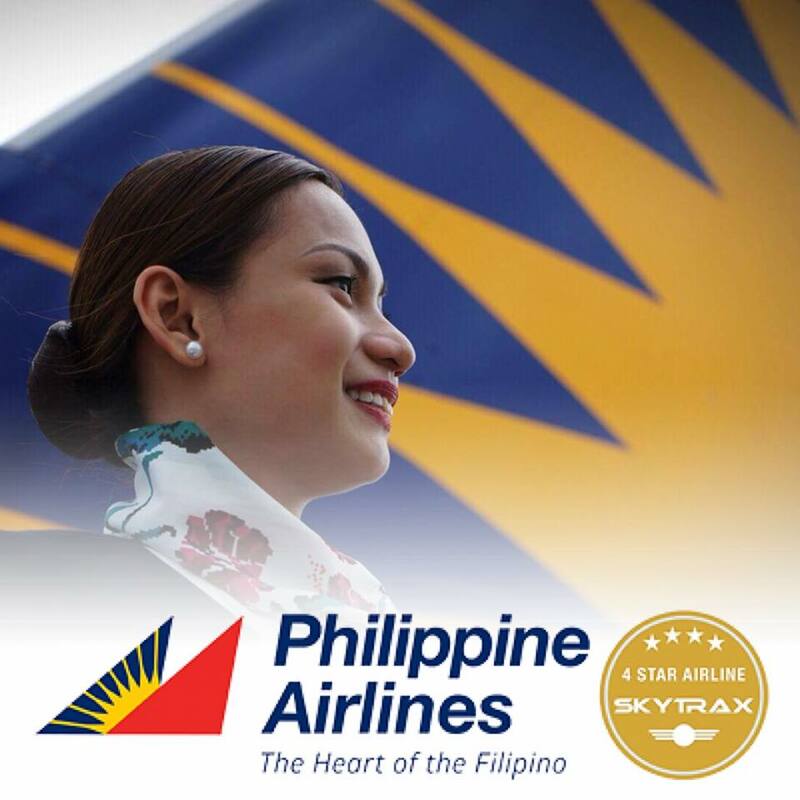 Truly, that flight was special as she helped a passenger nurse her baby while on board and she also passed the cabin crew evaluator position on that day. As of writing Organo's post is already shared in Facebook for over 28,000 from netizens. Yesteday, I was scheduled for a check flight to be qualified as a Cabin Crew Evaluator. I thought that this flight’s gonna be so special as this is a big step on my flying career. Everything went smoothly until after take off, I heard an infant’s cry, a cry that will make you want to do anything to help. I approached the mother and asked if everything’s okay, I tried to tell her to feed her hungry child. Teary-eyed, she told me that she ran out of formula milk. Passengers started looking and staring at the tiny, fragile crying infant. I saw the relief on her mother’s eyes. I continued to feed the baby until she fell asleep . I escorted her back to her seat and just before I left, the mother sincerely thanked me. Edited baby’s picture for her family’s privacy ❤️"